My kid’s school has a super cool take on hot lunches….different mom’s volunteer to cook a lunch for the masses and all the proceeds go to fundraising for the school. It has been successful for years, and it’s always great to hear the kids rave about different home-cooked meals. Most days my kids sack lunch it, and even then they come home requesting that I make a mock-version of whatever was dished up for lunch. I’m not kidding, these kids are treated like queens and kings….supping on things like homemade tortilla soup garnished with shredded cheese, chips and sour cream. I wish my cafeteria food had been half so good. Whelp, this week my kids were exceptionally proud and excited that their mom was the chef for the day. Now, what to cook for a bunch of kids with varying and discerning palates? I did NOT want to be the dud mom who caused kids to return home in the afternoon with grumbling tummies because the food freaked them out. The solution to my problem: a super meaty chili topped with cheddar cheese and a hefty side of garlic bread. To my tingling ears, I did my kids proud as their friends exclaimed and devoured the grub….or at least that is the report that I heard in the car on the way back home from school. So, I figured I’d share the recipe with you…it’s basic and easy, so feel free to experiment! 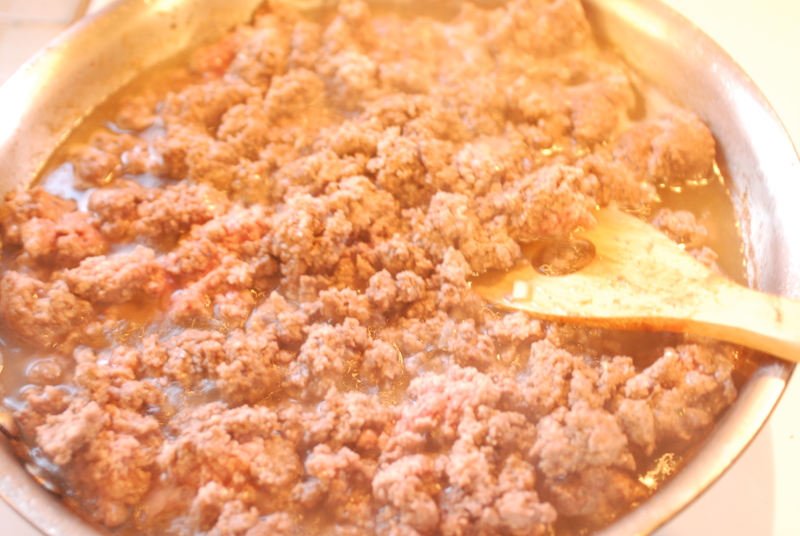 I started by browning 6 pounds of ground beef….yeesssss, 6 pounds. That’s the beauty of this dish, it’s hearty, filling, and perfect for a crowd. Once the meat is browned, drain off the fat and put your meat into a crock pot or a big dutch oven (aka a really big pot). Dice up two onions and 5 cloves of garlic. 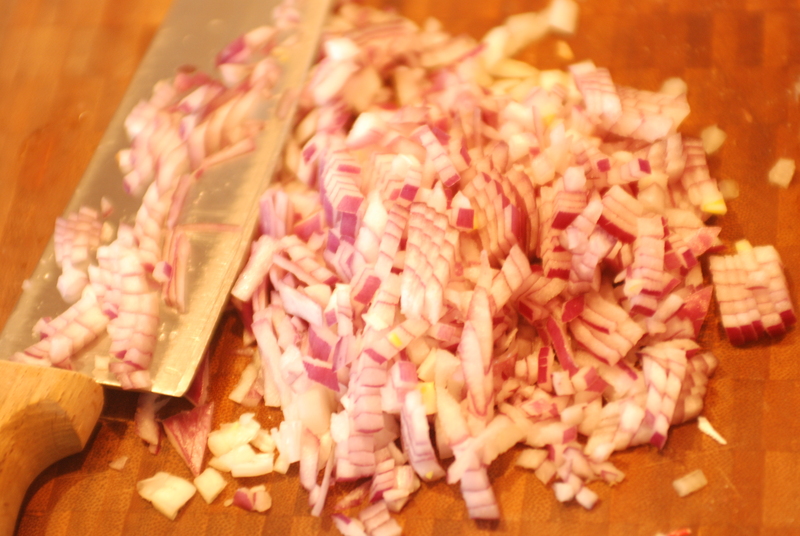 If you are cooking for kids, dice up those onions small (especially if you are cooking for kids who aren’t yours and may be picky about such things as onion and garlic chunks). Now, dump in a 40oz can of pinto beans (drained) and 2 28oz cans of pureed tomatoes. Can you guess???? If you are thinking cocoa powder, you are crazy right! 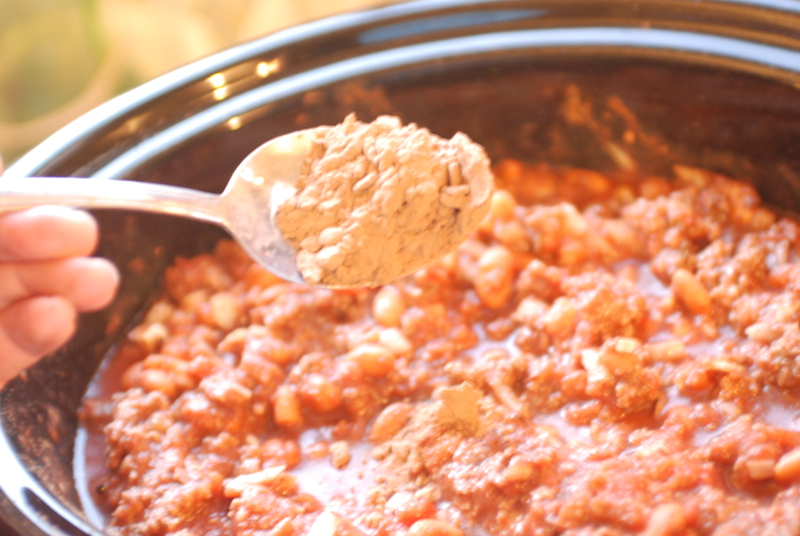 Add in 1 1/2 tablespoons of cocoa to your chili and the flavor will go from bright and tomatoe-y to gorgeously mellow and rich. Yum! Give her a bit of salt to taste and then just let her simmer away. 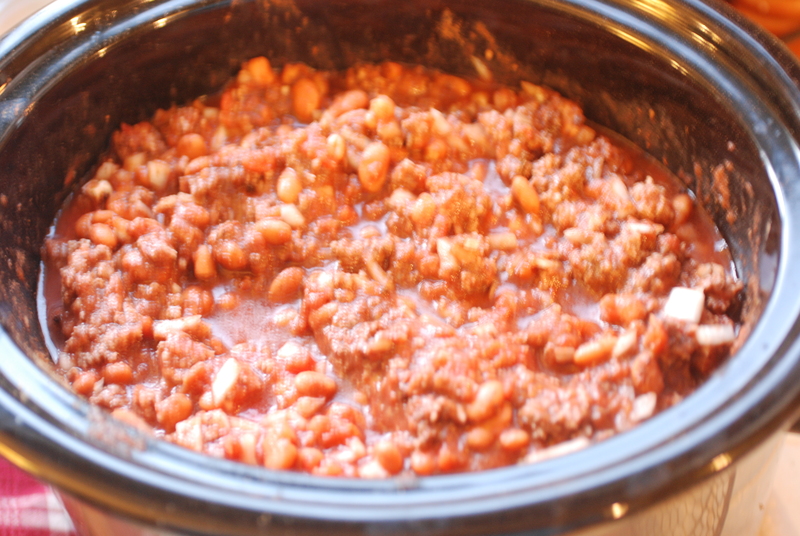 You can eat immediately or let the flavors meld in the crock pot for hours, your choice. Brown your meat and then drain off the fat. In a crock pot or large dutch oven, add the rest of the ingredients and simmer for at least 20 minutes….but it’s always yummy to let it simmer longer. Top with whatever you like on your chili: sour cream, cheddar cheese, green onions, Fritos, etc……approximately 20 servings.